Hey there! My name is Tara Devine, I'm 23 and I am from Minnesota, USA. I am a full-time volunteer with a global ministry called Youth With A Mission (YWAM). I live in Townsville, Australia and serve the local community here as well as in Papua New Guinea and New Zealand. Thank you for your prayers, encouragement, financial support and friendship - Without you my journey wouldn't be possible! As children we're often asked "what do you want to be when you grow up?" Some respond, "doctor, singer or teacher." I always answered "a missionary." I discovered at a young age that I had a deep love for God and a burning passion to help His children know how deeply loved they are by the one true King. In April 2017 I graduated university, moved across the world and joined YWAM to pursue my dream of making God known (Mark 16:15). 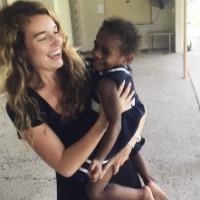 Since joining YWAM I have been on 2 outreaches: Papua New Guinea, where I taught the gospel and I have lead an outreach team to New Zealand, where I mentored students and worked in various schools and youth programs. I will be with YWAM Townsville, Australia until April 2020. Playing games with children in Papua New Guinea - Outreach, September 2017. Community engagement with Palm Island, Australia - Outreach, June 2017. Meet the students I lead on outreach to New Zealand - February 2018. YWAM is a global Christian missions organization, operating in more than 1,000 locations in over 180 countries. Our goal is to Know God & Make God Known! Discipleship Training School (DTS), is the first step to becoming a full-time missionary with YWAM. This school is 5.5 months long, consisting of 3 months of training and 2.5 months of outreach. PNG has significant health challenges - 5 women die in childbirth everyday, 1 in 13 children die before the age of 5 and 84% of the population live in rural areas, making it difficult to deliver health and training services. We operate a medical ship 11 months each year to help address these challenges.